This is a value play for 10mm ammunition. Not a lot of 10mm loads can make that statement. 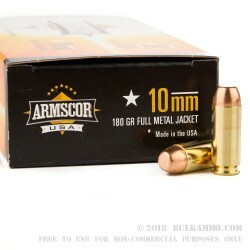 The considerable discount the Armscor 10mm affords the shooter, paired with good brass and consistent reliability makes this a great choice for range practice, with a round that is ordinarily difficult to shoot a ton of. This clean shooting 10mm is a slightly hot load but it isn’t trying to be: it just helps with reliable functioning in more firearms. The 10mm recoil is already slightly high anyways, so the increase in this round’s recoil over lighter range type loads is not significant. A truncated cone full metal jacket makes this a great feeding, reliable paper puncher but not a particularly strong defensive round in a broad field of 10mm performers in self-defense. It could certainly work in guns where feeding is a concern, but there are stronger loads more well suited to defensive scenarios. 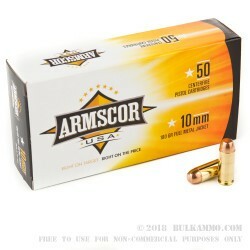 Armscor has a good reputation for offering cheap pricing for ammunition that just works and works well. 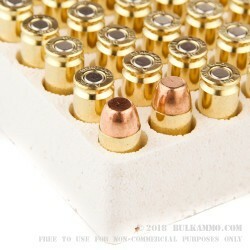 The brass is reloadable and the powder shoots clean so this case of 1000 rounds (20 boxes of 50 rounds each) is an excellent value choice for 10mm. Ideal x practice ammo... cheap in bulk, reliable, clean, solid loads. Not for defense, this is full 10 mm ammo but not the light side... there are others that are "hotter" and with defense specific bullet design, for the purpose of defense. 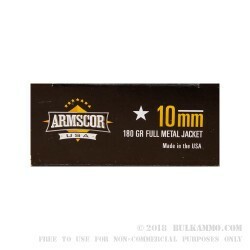 Awesome bargain for reliable 10mm ammo. A: Hello John! Armscor lists the muzzle velocity of this 180 grain round at 1150 fps. A: Hello Dave! Armscor lists the muzzle velocity of their 10mm ammunition at 1150 fps.